The Hazmat team was formed in 1987 through the cooperation of 24 communities joined in a Fire Department mutual Aid association. The Western Wayne County Hazardous Materials Response Team, or "Hazmat" team as it is often referred to, covers portions of three counties, thousands of square miles and provides service to residents numbering in the millions. The Westland Fire Department currently provides 3 personnel to the Hazmat team. These personnel are full time union firefighters that also respond to Hazmat calls when the Hazmat team is activated. All communities that are part of the mutual aid association are required to provide at least 2 members to the Haz Mat team. All Hazmat team members are “on call” 24 hours a day, 365 days a year. The 21 communities in the mutual aid association are; Belleville, Canton Township, Dearborn, Dearborn Heights, Detroit Metro Airports, Farmington Hills, Garden City, Huron Township, Inkster, Livonia, Northville, Northville Township, Novi, Plymouth Community, Redford Township, Romulus, Sumpter Township, Superior Township, Taylor, Van Buren Township, Wayne, Westland and Ypsilanti Township. The team’s success can be directly credited to the outstanding support and cooperation provided by each of these members of the WWCFDMAA. Personnel have been trained to handle a wide range of hazardous materials incidents, including those related to weapons of mass destruction. With Two custom hazmat trucks, two trailers and 2 mobile decon units the team is capable of sustained operations at several incidents and multiple entries into hazardous environments. State of the art monitoring devices and on site lab kits provide on scene information to personnel and authorities as to the hazards presented on scene. The team is also a Regional Response Team. 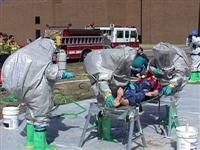 The Western Wayne County and the Down River Hazmat teams jointly form RRT 28 in Michigan. This effort has brought together all of the Wayne County Hazmat assets (excluding Detroit) and has increased available funding, equipment, and training. This increase also comes with increased responsibilities and additional requirements that make this team available to support emergency response efforts that the Governor deems appropriate. The State has approximately 16 Regional Response Teams throughout the state. Pictures of training at http://wwchirt.esmartweb.com/ or some in our Westland Firefighters picture galley.